You can edit a user role as needed. Changing a user role affects all users that have that role assigned to them. The changes to a role will take effect for each user with that role the next time he or she logs in. On the Settings menu, under Location, click (or tap) User Roles. The User Roles page opens. On the User Roles page, select a user role. The options for editing the user role become available. If necessary, type a different Role name (the role name must be unique). Under Full List, for each Security Category, click (or tap) the category to view the corresponding security rights. 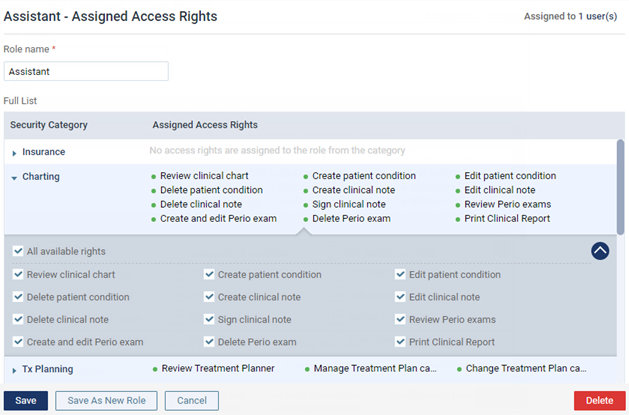 Select the check boxes of the rights that you want to assign to this user role. To select all the rights in a given category at one time, select the All available rights check box. Clear the check boxes of any rights that you do not want to assign to this user role. To save a copy of this user role as a new role (users with the original role attached will not be affected), click (or tap) Save As New Role. 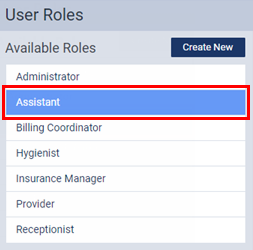 In the New Role dialog box that appears, type a New Role Name (or leave the one that you typed in step 2, if applicable; the role name must be unique), and then click (or tap) Save.